In our previous post, we saw how what kinds of steel are chosen to make barrels and the process by which they are drilled. Now we will continue discussing the process, after the barrel has been drilled. As we noted in our previous post, a deep hole drill bit is designed to drill a hole slightly smaller than the desired bore. For instance, if the final gun barrel is supposed to have a bore of 5.56 mm., the drill bit might drill a hole about 5.35 - 5.40 mm. in diameter. So the next operation to be done is called reaming and the process uses a reaming machine to do this. The picture above is a reaming tool. A reaming tool is made of either tool steel or (in more modern times) tungsten carbide. A typical reaming bit is a cylindrical tool which has a set of multiple straight or helical cutting edges which are parallel to each other on the circumference of the cylinder. A reaming tool only removes a small amount of material (typically between 0.1 and 0.2 mm. at most) and is used to perform accurate sizing of a bore's diameter and also produce a smooth finish on the inside of the barrel. The white part in the picture above is just soft tape and is present to prevent the reamer from vibrating when it is inside the barrel. 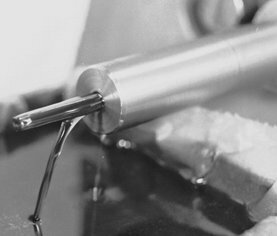 The reamer bit is put in through the barrel and then oil is pumped in, but at a lower pressure than the drilling operation we saw in the previous post. Unlike drilling, in the reaming operation, the reaming tool is rotated and the barrel is kept still. The reaming tool is rotated at speeds of 200 - 500 rpm or so and the barrel is pulled through the reaming tool at a rate of about 2 - 5 cm. per minute or so. The oil keeps the reaming tool cool and flushes out any metal filings. In the picture above, you can see the reaming tool coming out of the barrel and dirty oil coming out of the barrel as well. The oil is filtered by a series of sieves to remove the metal particles and the oil is recycled. Reaming produces a much more smoother finish than drilling and only removes a small part of the material, hence this is a finishing up operation. Some low quality barrel manufacturers skip the reaming operation altogether and merely drill the hole to the desired bore, which saves a bit of money, but doesn't provide a dimensionally accurate hole. All quality barrel manufacturers invariably drill a hole a little smaller than the desired bore and then use a reamer to make it the exact diameter and finish the insides with a smooth finish. We will not talk much about the rifling techniques here, since they've already been discussed. Cut rifling is generally preferred by small custom barrel makers and the last four methods are used by larger gun making companies. Note that broach rifling, button rifling, hammer forging and flow forming add additional stress to the barrel due to their methods of machining. 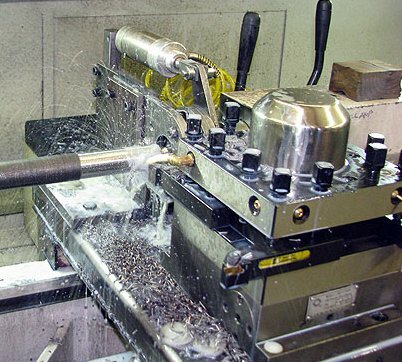 Because of the drilling, reaming and rifling operations, considerable stress is induced into the barrel and this needs to be stress relieved again before further operations can happen. If you remember, we mentioned that the barrel blanks are already stress-relieved by the external vendor before they're delivered to the barrel maker. This operation needs to happen again after the rifling operation is done, because the above three operations introduce considerable stress on the barrel and may cause it to deform in the next few operations if this isn't done. There are usually two ways of stress relieving a barrel. The first way (traditional method) is to heat the barrel to about 525 - 550 degrees centigrade and then let it cool slowly back to room temperature. The second method (cryogenic stress relieving) is to cool the barrel to extremely low temperatures (say -185 degrees centigrade) and control the cooling time and temperature cycle. At this temperature, the molecules that were pushed out of the way during the machining operations are realigned again and this relieves the stress on the barrel. After the rifling operation is done, the barrel may be profiled or contoured on the outside. Basically, when a gun is fired, the most pressure occurs on the breech end of the weapon (i.e.) the side where the cartridge is, and the least pressure is at the other end of the barrel (i.e.) the muzzle. Hence, it is not necessary for the barrel to be of uniform thickness throughout the length of the barrel. 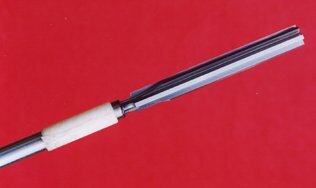 Several manufacturers reduce the weight of the gun by removing material from the outside of the barrel, so that the walls of the muzzle end are thinner than the walls on the breech end. This operation is called contouring or profiling. These days, most contouring operations are done using a Computerized Numerically Controlled (CNC) lathe. The precise profile of the outside of the barrel is fed into a computer, which controls the lathe and produces the desired profile on the barrel. Note that if proper stress relieving was not done earlier, the act of contouring may distort the barrel. This is because the stored stress from the earlier processes will start to act upon the side of the barrel where the outside is thinner and the bore will become bell-shaped. The final process done to the steel barrel is called lapping. Generally, lapping is only done to really high-end custom made barrels and is not normally done on mass-produced barrels. The reasons to perform lapping are to remove any machining marks, surface polish the inside of the barrel, eliminate any tight spots etc. This operation is generally a manual one and is done by an expert. 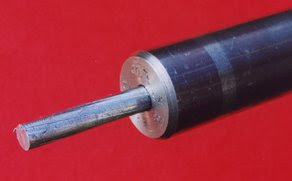 Initially a rod similar to a cleaning rod is pushed into the barrel. Then the barrel is placed vertically and molten lead is poured down the other end of the barrel and allowed to solidify. When the lead has solidified, it is shaped exactly like the shape of the inside of the barrel. The lead lap is then extracted and lapping paste is added to the outside. Lapping paste is similar to the paste that is used to grind valves in automobile engines. The rod is then pulled and pushed through the length of the barrel multiple times and more paste or oil are added as needed. This process polishes the inside of the barrel to a very fine surface. After this process, the barrel may be mounted to a stock, sights may be attached on the exterior, it may be chambered for a given cartridge and the barrel itself may be blued or browned along with the action of the gun. for quite a long time I am looking for information, regarding exact size of drill bits and reamers used for each pistol caliber. My question is : can I find somewhere a chart, where is listed what is the recommended drill size and reamer size for each caliber? Something like example you are mentioning in your article with caliber 5.56, that is used 5,40 drill to be made. I will appreciate if you give me information for what size bits and reamers should i use for .320 ACP, 9X19 and 9X18 Marakov barrels drilling.